To Cite: Naghavi N, Taheri M, Irandoust K. Psychophysiological Responses to Cognitive and Physical Training in Obese Elderly, Int J Sport Stud Hlth. 2018 ; 1(3):e83935. doi: 10.5812/intjssh.83935. Objectives: Increasing prevalence rate of anxiety disorders in elderly populations especially due to physical limitations has become a key concern for health authorities. Therefore, the objective of the study was to investigate the effects of cognitive and physical training on anxiety in the Elderly. Methods: 49 aged females (62.3 ± 2.6 years) with BMI of 35 - 49.99 kg/m2 were assigned to one of three groups: Cognitive (n = 17), yoga (n = 16) and control group (n = 16). The cognitive training protocol focusing on breathing techniques, autogenic training, imagery/visualization, included an 8-week period, three sessions a week. Yoga practices comprising Asana training, Pranaya training, and meditation were conducted 3 times a week, for 8 weeks. The State-Trait Anxiety Inventory was given before yoga practice and cognitive training. Biofeedback devices were used to monitor galvanic skin resistance and resting heart rate. The data were analyzed using independent t-test and one-way ANOVA test. 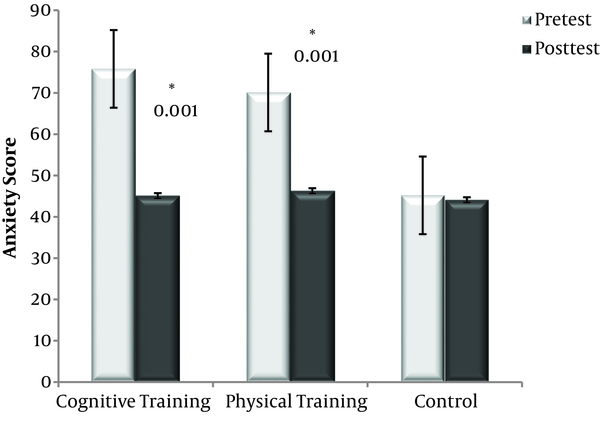 Results: The results indicated that both cognitive and physical training had a significant difference on Anxiety in the training groups (P ≤ 0.05), while no significant change was found for control group (P ≥ 0.05). Furthermore, both training modes decreased the skin potential response (SPR) (P < 0.001). In addition, physical training group had lower resting heart rate after intervention compared to the cognitive and control groups (respectively, P = 0.04 and P = 0.001) lower heart rate and skin conductance level over the entire measurement period. Conclusions: It was concluded that the health benefits of yoga aren’t not specific to maintaining physical health, but also extends to lowering the anxiety in elderly with obesity. It was also suggested that cognitive training can mitigate the anxiety symptoms in the elderly while no physical changes were shown in cognitive training. Copyright © 2018, International Journal of Sport Studies for Health. This is an open-access article distributed under the terms of the Creative Commons Attribution-NonCommercial 4.0 International License (http://creativecommons.org/licenses/by-nc/4.0/) which permits copy and redistribute the material just in noncommercial usages, provided the original work is properly cited. Currently, there is an epidemic of sedentary lifestyle, obesity and psychological disorders in elderly populations worldwide which has become a key concern for health authorities (1-5). On the other hand, obesity as a health risk factor has been significantly increased among older adults (6). Although pharmacological treatments may not be highly recommended for older adults due to the side effects, non-drug strategies such as exercise therapy has been widely recommended by researchers with the aim of improving the quality of life (7). In this regard, exercise is often the first step in lifestyle modifications for the prevention and management of physical and psychological disorders from childhood to aging (8, 9). Two common exercise types are commonly used for getting a more profit in elderly, either physical or cognitive training. The benefits of mental imagery as a cognitive strategy for athletes have been well documented in some studies (10, 11). As a strategy for improving the motor control in the elderly, it has been shown that mental imagery not only contribute to the lowering the muscle fatigue, but also extend to increasing the muscular strength, perceptual motor skills and motor preparation (10, 11). Increasing prevalence rate of anxiety disorders in elderly populations especially due to physical limitations has become a key concern for health authorities. In line with the aforementioned aims, our study strategy predominantly included considering the effect of either cognitive (mental imagery) or physical training (yoga) on anxiety and biofeedback responses (resting heart rate and galvanic skin resistance) in obese elderly females. A randomized controlled trial was conducted to test the effects of cognitive and physical training on anxiety in the obese elderly. Forty nine aged females with BMI of 35 - 49.99 kg/m2, who were sedentary and had no history of physical limitations, were studied in two pretest and post-test phases. They were randomly assigned to one of three groups: Cognitive (n = 17; 63 ± 3.4 years); yoga (n = 16; 62 ± 2.9 years) and control group (n = 16; 63.1 ± 3.1 years). 4 subjects were excluded due to the absence in the training sessions more than 2 sessions. Biofeedback devices including four channel biofeedback (manufactured by Parsadar Asia ltd, Model: PM-B128911) and polar were used to monitor galvanic skin resistance (GSR) and resting heart rate (RHR) respectively. The cognitive training protocol included a 8-week mental imagery training, three sessions a week, taught by a psychologist. Controlling the thoughts, providing the positive thoughts and emotions; changing self-talk from negative to positive one; confronting negative thoughts, were of major parts in the protocol. Other technique used, were breathing techniques, autogenic training, imagery/visualization. Their biofeedback signs (heart rate and galvanic skin response) were assessed before and after study intervention (12). Yoga practices comprising Asana training, Pranaya training, and meditation were done 3 times a week, for 8 weeks on the basis of keeping proper postures, stretching the muscles of the extremities, trunk and neck done in all postures of standing, sitting, supine and prone. The state-trait anxiety inventory (STAI) was given before yoga and mental practices in order to measure the obtained differences of trait anxiety in groups. STAI consists of 20 questions concerning trait anxiety. The Internal consistency of inventory was reported 0.86 to 0.95; and its test-retest reliability coefficients was about 0.65 - 0.75 (13). The questionnaire contains both anxiety questions (e.g. I feel frightened, I feel upset) and anxiety absent questions (e.g. I feel calm, I feel relaxed). Written informed consent was obtained from all subjects and the study procedure was approved by ethical committee of Imam Khomeini International University (Ref no: 17628). The research was performed in accordance with the ethical standards of the Helsinki Declaration (1964). The data were analyzed using dependent t-test and one-way ANOVA test. As seen in Table 1, there was a significant difference in anxiety score of subjects after exercise treatment (P = 0.001). Post-hoc LSD test suggested that both experimental groups (physical and cognitive training) had a significant improvement in the anxiety after study treatment (P = 0.001) while no significant difference was found between the two experimental groups (P = 0.18). Dependent t-test result is shown in Figure 1. Both experimental groups had a significant improvement in anxiety (P = 0.001), while no difference was found for control group (P = 0.71). Furthermore, both training groups had lower galvanic skin resistance (P < 0.001). In addition, physical training group had a better status of resting heart rate after intervention compared to the cognitive and control groups (respectively, P = 0.04 and P = 0.001). Considerable evidence exists that aerobic exercises tends to improve psychophysiological performance of elderly population. Given the increasing tendency of Iranian elderly to participate in mindfulness practices such as yoga , and psychological intervention like mental imagery, we were to study the effects of two different exercise types (physical versus cognitive) on the anxiety status, resting heart rate and galvanic skin resistance of aged persons. Although all Psychophysiological responses (Anxiety, GSR, and RHR) were improved in both intervention groups, physical training group (yoga) just had a significant improvement in RHR. In the explanation of the last one, it can be stated that there are some physiological adaptations following resistance exercises leading to the better cardiovascular functions (14). Regarding the beneficial role of mental imagery technique on anxiety, It can be stated that mental imagery is capable of improving the motivation (11), self-efficacy (11, 15), self-confidence (11), and controlling competitive anxiety (15). Conclusively, Cognitive strategies are reliably associated with anxiety improvement. The typical consequences of mental imagery comprise the muscle fatigue reduction; increased muscular strength; enrichment of perceptual skills and enhancement of motor preparation in the elderly. Since the health benefits of exercise induced weight loss has been concerned a key reason for anxiety improvement in athletes (16), conducting the same study is highly recommended in future studies. As suggested, yoga as an exercise treatment is not specific to maintaining psychophysiological health, but also extends to lowering the anxiety in elderly with obesity. It was concluded that the health benefits of yoga aren’t not specific to maintaining physical health, but also extends to lowering the anxiety in elderly with obesity. It was also suggested that cognitive training can mitigate the anxiety symptoms in the elderly while no physical changes were shown in cognitive training. Special thanks to all participants who generously devote their valuable time to the study. 1. Jafari M, Pouryamehr E, Fathi M. The effect of eight weeks high intensity interval training (HIIT) on E-selection and P-selection in young obese females. Int J Sport Stud Hlth. 2017;In Press(In Press). e64336. 2. Bandelow B, Michaelis S. Epidemiology of anxiety disorders in the 21st century. Dialogues Clin Neurosci. 2015;17(3):327-35. [PubMed: 26487813]. [PubMed Central: PMC4610617]. 3. Sharif MR, Sayyah M. Assessing physical and demographic conditions of freshman" 15" male medical students. Int J Sport Stud Hlth. 2018;In Press(In Press). e67421. 4. Irandoust K, Taheri M. The effects of aquatic exercise on body composition and nonspecific low back pain in elderly males. J Phys Ther Sci. 2015;27(2):433-5. doi: 10.1589/jpts.27.433. [PubMed: 25729184]. [PubMed Central: PMC4339154]. 5. Taheri M, Irandoust K. The effect of balance exercises and computerized cognitive training on psychomotor performance in elderly. J Phys Ther Sci. 2017;29(12):2097-9. doi: 10.1589/jpts.29.2097. [PubMed: 29643582]. [PubMed Central: PMC5890208]. 6. Irandoust K, Taheri M. The effect of vitamin d supplement and indoor vs outdoor physical activity on depression of obese depressed women. Asian J Sport Med. 2017;In Press(In Press). doi: 10.5812/asjsm.13311. 7. Amini M, Mirmoezzi M, Salmanpour M, Khorshidi D. Effect of 8-week of selected aerobic exercises on improving the quality of life in healthy aged inactive men. Int J Sport Stud Hlth. 2018;In Press(In Press). e67514. 8. Pavlovic R, Joksimovic M. Differences in anthropometric traits and trend of changes in high school students. Int J Sport Stud Hlth. 2018;In Press(In Press). e68101. 9. Avlund K. Fatigue in older adults: an early indicator of the aging process? Aging Clin Exp Res. 2010;22(2):100-15. [PubMed: 20440097]. 10. Tod D, Edwards C, McGuigan M, Lovell G. A systematic review of the effect of cognitive strategies on strength performance. Sports Med. 2015;45(11):1589-602. doi: 10.1007/s40279-015-0356-1. [PubMed: 26378003]. 11. Slimani M, Tod D, Chaabene H, Miarka B, Chamari K. Effects of mental imagery on muscular strength in healthy and patient participants: A systematic review. J Sports Sci Med. 2016;15(3):434-50. [PubMed: 27803622]. [PubMed Central: PMC4974856]. 12. Keilani M, Hasenohrl T, Gartner I, Krall C, Furnhammer J, Cenik F, et al. Use of mental techniques for competition and recovery in professional athletes. Wien Klin Wochenschr. 2016;128(9-10):315-9. doi: 10.1007/s00508-016-0969-x. [PubMed: 26932798]. [PubMed Central: PMC4875065]. 13. Spielberger C, Gorsuch R, Lushene R, Vagg P, Jacobs G. Manual for the state-trait anxiety inventory. Palo Alto, CA, Consulting Psychologists Press; 1983. 14. Phillips BE, Williams JP, Greenhaff PL, Smith K, Atherton PJ. Physiological adaptations to resistance exercise as a function of age. JCI Insight. 2017;2(17). doi: 10.1172/jci.insight.95581. [PubMed: 28878131]. [PubMed Central: PMC5621901]. 15. Beauchamp MR, Bray SR, Albinson JG. Pre-competition imagery, self-efficacy and performance in collegiate golfers. J Sports Sci. 2002;20(9):697-705. doi: 10.1080/026404102320219400. [PubMed: 12200921]. 16. Yousef Abadi HA, Mirzaei B, Habibi H, Barbas I. Prevalence of rapid weight loss and its effects on elite cadet wrestlers participated in the final stage of national championships. Int J Sport Stud Hlth. 2017;In Press(In Press). e64316.